I am so excited for the holidays, I feel like I get ten times cheerier with the first Christmas song I hear! And to celebrate this most joyful season, I am making a series of holiday gift guides, specified for each type of person in your life! The first guide is geared for the 'classic lady' that you need to shop for. The preppy girl in pearls that writes everything down with a gold pen and listens to classical music while reading Nancy Drew books. She drinks tea and wears ribbons in her hair, that girl. Getting something personal is key when it comes to this type of girl, chances are 90% of her items are monogramed. Maybe she's practical and would love a nice pair of gloves or journal. Maybe she loves a delicate piece of jewlery. Either way, you absolutely can no go wrong with anything on this list! 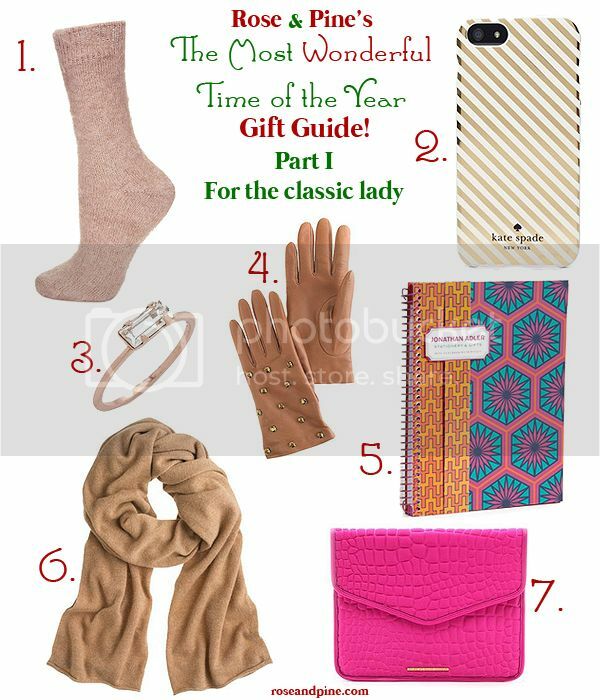 Great ideas for gifts! Thanks for a wonderful post!